Click To Enlarge / Shan Moore PhotoThe Missouri Mudders hosted round 6 of the NEPG National Enduro Series and the second ISDE qualifier round in Park Hills, MO. Rain soaked the 65 mile course Friday and Saturday adding to the difficulty of a rugged, hilly and rocky event. This event typically includes sections through the open sand flats of the old mining remains and several sections through the heavily wooded hills and creeks of the park, which are littered with rocks, and a mix of black dirt and slick clay. I headed out to the park’s public riding area to set up my race bike in the pouring rain. After a few small bike adjustments My Husaberg felt stable in the rough trails and my Pirelli tires would bite confidently in the wet soil. A quick trip to the car wash got the bike cleaned up and a chance to change my tires out of the rain and mud before I set up pits in the staging area. I was prepared for rain on race day but the sky held off for the race. Once off the starting line, I took a huge crash into a hidden stump that ruined my goggles, gloves, and just about everything else with mud. My wreck was overshadowed by an even more spectacular crash by Wally Palmer in the same spot. My first section was a struggle to hold on with wet gloves. Section 2 was a relief as I had new gloves and Smith Roll-Offs waiting for me. Section 3 started with a narrow line that twisted down a hillside deep into the woods through rocks and mud. I knew here that this would be a section where patience would pay off. So I slowly built momentum and tried to remain aggressive while focusing on smoothness. I kept the bike upright and railed to a time 4 seconds off of Mullins blistering pace. I maintained my solid form into section 4 running third fastest after a few small tip-overs. The fifth test had a mix of miles of sand track and slippery tight wooded trails. Early on, debris jammed under my brake lever rendering it useless costing my nearly a minute to the leaders. Going into the sixth and final test, with the brake freed up, I had no real idea how my score was fairing, but I was going to leave whatever I had left on the trail. I happened to leave a radiator shroud borrowed from teammate Lafferty and my goggles. The shroud, after a washout on an off-camber rock and the goggles came off just after a wet and rough creek section. I remained cautious of my exposed eye-balls the next 5 miles. 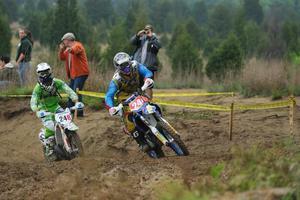 A Podium finish of 3rd overall was the reward for trudging through a rough yet fun day aboard my Husaberg FX 450. A podium was very relieving and satisfied my goal for the day although I admit it was unsettling knowing the time I spent on a seasons worth of incidences in one day could have been costly. Thanks to: Husaberg, Enduro Engineering, Akrapovic, Pirelli, Motorex, RidePG, EBC, Renthal, Genuine Dirt Racer, TroyLeeDesigns, Smith Optics, BRP, and Tire Balls. Special thanks to Bryan, Tony, and Robbie for digging the tree branch out from under my brake lever!